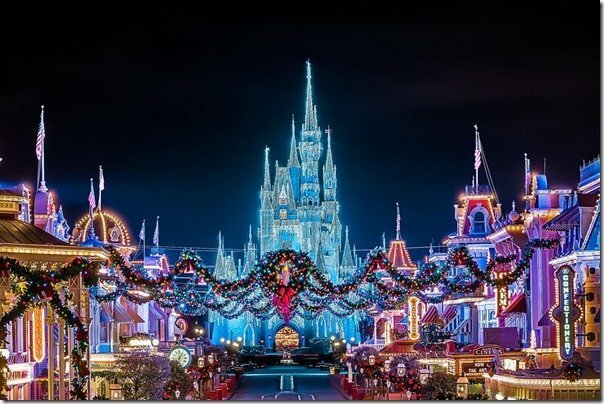 From California’s Disneyland to Florida’s Walt Disney World, Disney spares no expense in making the holidays as magical as everything else they touch. While each park hosts an array of festive attractions, shows, and decorations, it shouldn’t be overlooked that there is just as much Christmas cheer available to visitors right outside the ticket center. Disneyland comes alive in the winter months with twinkling lights and the overall magic of the season. From the festive Downtown Disney, to the beautifully decorated Disneyland Resort Hotels, there is so much you can enjoy outside of the park during the holidays. At Downtown Disney District, you can experience all the magic of Disney without entering the gates. 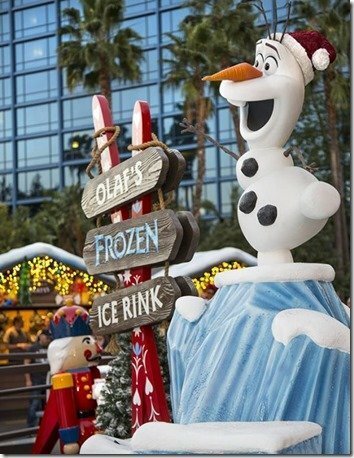 Olaf’s Frozen Ice Rink is the perfect way to get in the holiday spirit. Visitors can enjoy skating on the Disney-made ice rink surrounded by a “Winter Village” featuring lights, garland, and “snow” covered pine trees. Enjoy a hot cup of cocoa from Ghirardelli while perusing the many carts and chalets filled with gifts and personalized ornaments for the holiday season. 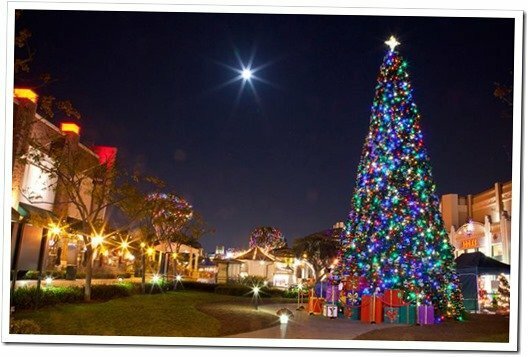 Live performances and Holiday Carolers make the Downtown Disney District a cheerful addition to your Christmas festivities, and would be the ideal location for a first date with your fellow MouseMinglers. Take a tour of the decorations on display at The Disneyland Resort Hotels. While, enjoying the sites, you will be entertained by Christmas carolers that perform in the lobby of each of the three magical hotels. 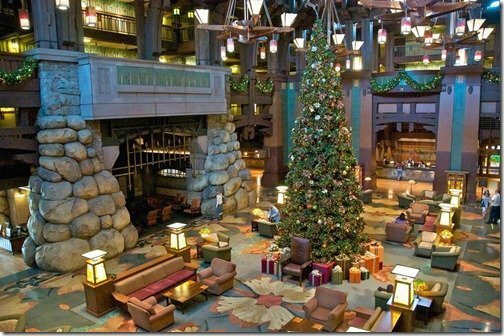 The Disney’s Grand Californian Hotel & Spa is home to a 7.5 feet tall and 12 feet wide giant gingerbread replica of the hotel itself. It required over 500 pounds of gingerbread and 60 gallons of icing, but it was well worth the effort. The smell alone will make you glad you came to take in the sights of the hotel’s Craftsman inspired holiday decor and stunning Christmas tree. 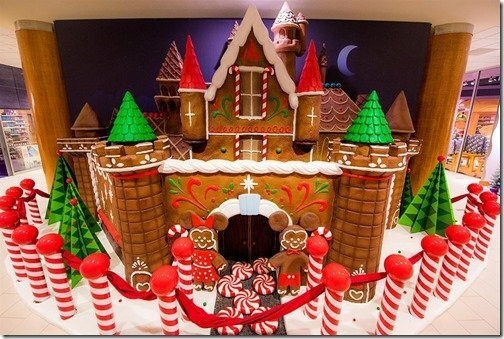 Not to be outdone by the neighboring Grand Californian, the Disneyland Hotel features giant gingerbread castle inspired by the enchanted Sleeping Beauty Castle. Take a tour of the hotel’s different Disney-themed towers and check out how each one expressed their take on the holiday season. The hotel also hosts a special meet and greet spot for the big man himself….Santa Claus! 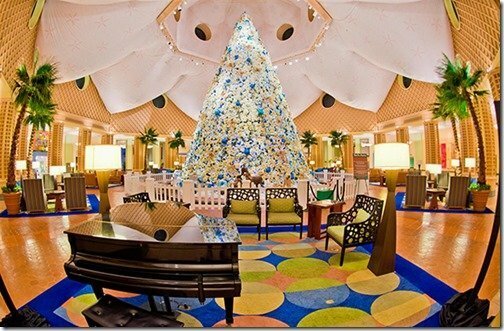 Disney’s Paradise Pier Hotel lobby features a magical sea-inspired Christmas tree. With surfboards, starfish, shells, and more, this is one tree you will want to take some time to admire up close. Not to mention, it would be the perfect backdrop for a Southern California Christmas card. While Disney World’s parks are known for outdoing themselves for the holidays, a lot of holiday cheer can be found outside the gates as well. 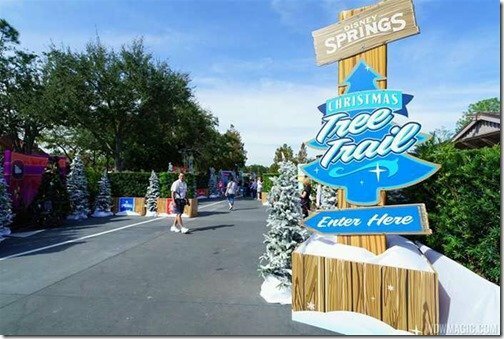 This year, Disney Springs is introducing “Christmas Tree Trail”, a 15 tree display that each pay tribute to favorite Disney characters, including Mickey & Minnie, The Muppets, Moana, Frozen, and more. This is Disney, so expect the experience to be made all the more magical with holiday music and a light “snow” fall. 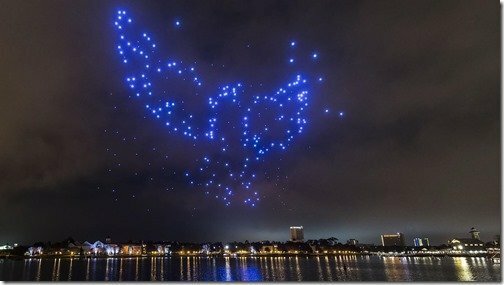 When you’ve finished roaming around Disney Springs, taking advantage of all the decorations, shops, carolers, and the like, don’t forget to stick around for the new Christmas drone show, “Starbright Holidays – An Intel Collaboration,” featuring 300 RC helicopters illuminating the night sky to the sounds of classic holiday songs recorded by a full orchestra! No visit to Disney for the holidays would be complete without a tour of the many Disney World resorts. This is a task that could take up a day of its own, so we will simplify things a bit and just give you the highlights. It is Arendelle meets Small World all covered in gingerbread. 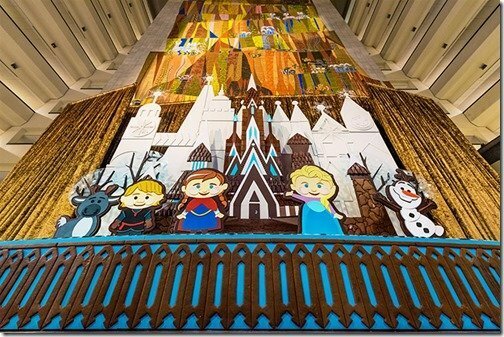 This impressive Mary Blair inspired gingerbread display is adorable, with hidden Olafs and a 17 foot tall Elsa’s Ice Castle. The Contemporary is also home to one of Walt Disney World’s oldest trees, which sports a retro-futuristic style that is breathtaking when illuminated. 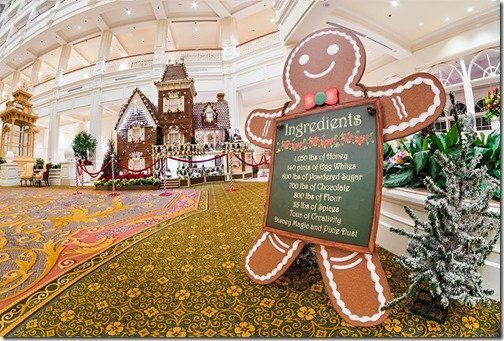 Disney’s Grand Floridian Resort & Spa has made a name for itself with the annual arrival of a life-sized gingerbread house made up of tasty ingredients and a bit of Disney Magic. 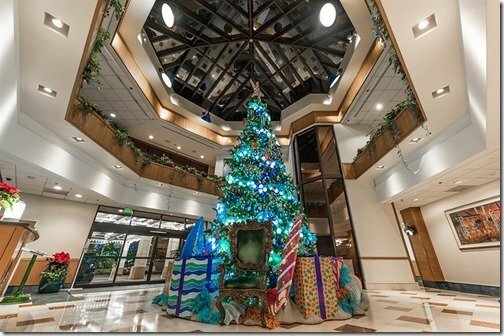 The resort is full of little hidden treasures to keep you in the holiday spirit, but make sure you don’t overlook the enormous Christmas Tree on display in the front lobby. Really though, you can’t miss it… it’s HUGE! The Swan & Dolphin isn’t one that typically makes the list of must see Disney Christmas spots, but they have proclaimed themselves “Santa’s favorite Resort” so it’s worth a look. The property houses a beautiful poinsettia Christmas tree along with other holiday decor and an edible display that will bring a smile to your face. 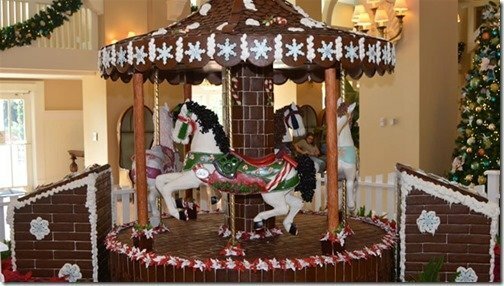 The Disney Beach Club Resort is dripping in garland and holiday cheer, but the highlight of this resort has to be the hand-crafted, edible carouse featuring chocolate and fondant ponies, delicate snowflakes, and gingerbread castle. 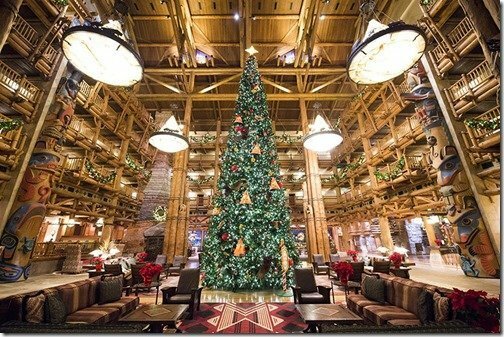 For a cozy, rustic Christmas, head to Disney’s Wilderness Lodge. The entire display is just breathtaking starting with the massive Christmas tree and holiday decorations that make use of the woodland theme with wood carvings, pine cones and antlers. While you are there, it just makes sense to stop by the campgrounds of Fort Wilderness. 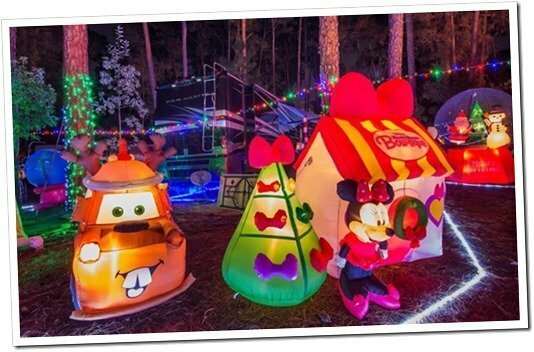 Lovingly designed by long-term guests on the campground loop, this is a Christmas display no one will scoff at. It may not be as elaborate or fancy as the Disney designed decor of the resorts, but trust us, it is no less impressive!